"Kid Cudi Wears A Denim Shirt And Red Sneakers"
Whoa! 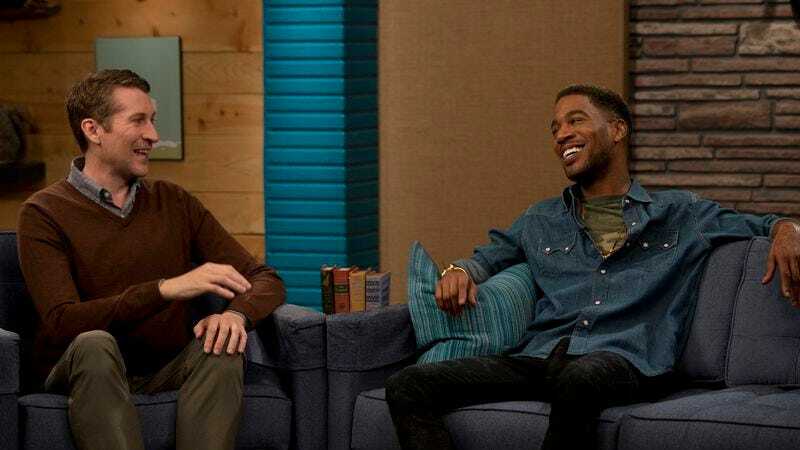 With this week’s announcement that Kid Cudi will step into Reggie Watt’s spot mid-season, when Watts leaves to take over as The Late Late Show’s bandleader, the stakes for his first guest appearance on Comedy Bang! Bang! got higher. It’s fair to say this episode suddenly carries a lot more… luggage. Reggie’s struggle to move on after he’s dumped by an ex speaks to all of us who have misgivings about his departure. This episode isn’t the funniest of the season, but it slyly eases the audience through the stages of grief while introducing the future co-host. Though Reggie sometimes gets sidelined for most of an episode, “Kid Cudi Wears A Denim Shirt And Red Sneakers” presents a three-man team of Scott, Reggie, and Kid Cudi riffing together as other guests bop in and out. Even the long and frequent Luggage segments cut back repeatedly to reaction shots of Kid Cudi sitting on Sir Couchly, looking plenty at home alone on set. Luggage takes up a ridiculous amount of time, and it’s one of those drawn-out CB!B! bits, starting intentionally slight and building up to absurdity as it goes on… and on… and on. Melinda (Angela Trimbur, whom you may recognize as Angela/Christina from Community webisodes, from The Birthday Boys, or from Reggie Watts’ rickroll video) does some amazing body work, all rippling posture and shifting jaw. (Kudos to wardrobe, too, for the snug floral dress that shows every oscillation.) Her unceasing wiggles and game show rictus make a nothing part into something hypnotic as Luggage goes on… and on… and on. Did I mention it goes on… and on… and on? The episode is packed with weird, great physical comedy, from Trimbur’s undulations to Scott’s long, deep bows as he rasps out “Luggagggggggge” to the jumping and shifting of six-year-old film critic Aiden Tomasetto (Noël Wells). Even the reactions of the adults around Aiden are mostly physical, and notably realistic: Kids and their enthusiasms can be fascinating, but this segment nods to how very tedious they can be, too. The heavy-lidded resignation of Scott, Reggie, and Kid Cudi as they try (and fail) to dissuade Aiden from recounting his favorite films is an expression most grown-ups recognize. Aiden’s segment-closing “I need love!” to Kid Cudi, and his response, highlights his role in this episode: He reacts as much as he acts, and those reactions are mostly about going with the flow. He treats Aiden not with the ironic distance some performers would employ, but with earnest concern and back-patting, answering the child’s bathroom plea with “You need to go pee-pee?” and vainly, sweetly, trying to restrain Aiden with a string of exclamations (“Okay, all right, you’re a big boy, WHOA!”) as Wells climbs onto his lap. Scott introduces his guest as “hip-hop star Kid Cudi,” but he’s more than that. Scott Mescudi (maybe we can call him “Cudi,” but not until we sign the official friend waivers) has already shown his acting chops as Domingo in How To Make It In America, and more recently in a guest spot on Brooklyn Nine-Nine. His first segment had me laughing out loud, as did the long, quick string of Prince impressions, and the way he buys into every premise with conviction and compassion dovetails into the essentially heartwarming Comedy Bang! Bang! universe. The whole episode centers around the idea that we all need love of one kind of another, and on the ways we distract ourselves from its absence and our own inadequacies. Even Henry Winkler’s laugh-packed opening scene as encyclopedia salesman (and encyclopedia writer) Leonard Rascal touches on his crush on Renee, his next-door neighbor who comes over to scare off lizards whenever he yells for her, and on his inability to grapple with a world that’s left him behind. The dismay that washes over his face as he realizes he’s never written an entry for Internet (in Volume H, for home to websites) demonstrates the weird humanity at the heart of most of CB!B!’s sketches. That humanity, and the trouble the series takes to confer it upon its regulars and some of its tiniest bit players while also creating some of the strangest, sweetest comedy on TV, is part of what lets viewers connect to the show’s universe so wholeheartedly, and part of what makes it so hard to see Reggie preparing to leave it. It’s true. Reggie Watts plays on an odd frequency, and either it resonates with you or it doesn’t. When the show was first announced, Reggie—a recurring podcast guest promoted to TV sidekick—felt (at least to me) like an unexpected addition to Aukerman’s voice. But he rapidly became the heart of the show for me, and I’m sure for some of you. Reggie’s sendoff episode airs June 5th, so we can cherish him on the show until then. And then let’s make room in our hearts for Kid Cudi, because Melinda’s callous, but she’s right. Sometimes, you just have to accept change and move on with someone new, whether that someone’s a charming hip-hop artist turned actor or a repellent model train enthusiast. The truth is, no one can replace Reggie Watts. His musical style, his reliably off-beat readings, and his mixture of gentle cerebral humor and pure silliness can’t be replicated. Comedy Bang! Bang! knows better than to try to mimic them, or him. But the engaging wit and warmth Kid Cudi shows in this episode suggest he can carve out a niche as distinctive and as beloved as his predecessor. Not many people could fill Reggie’s shoes—and his deep-furrowed foot grooves—but Kid Cudi seems like a great candidate. Reggie’s onscreen credit: Reggie Watts. Musician — True Origin Unknown. That’s Todd Barry playing straight man as Kid Cudi’s manager. Reggie’s a notary public, so at least he has something to fall back on in case this whole Late Late Show thing doesn’t work out. On a somber note, I know many of you are as heartsick as I am over the death of Harris Wittels. Writer and executive producer for Parks And Recreation, Wittels was also a comedian, musician, and podcast host who graced both the podcast and the television version of Comedy Bang! Bang! with his presence. My heart goes out to those who know and love him, and the rest of us have Comedy Bang! Bang!’s “Farts and Procreation” trilogy (podcast episodes 120, 166, and 219) to help us remember Harris Wittels at his best. Update: On February 22nd, Earwolf released Comedy Bang! Bang! episode 336, “NOT Parks And Recreation 4,” with Adam Scott, Chelsea Peretti, and Harris Wittels in his last CB!B! appearance. I’ve just started the episode, but I warn you: Scott Aukerman’s introduction made me cry.